Oil painting on canvas, The Hon. Phyllis Elinor Legh, Mrs Henry Gerard Walter Sandeman (1895-1986), signed (? ), 1912.A bust-length portrait of a young woman, body facing right, head turned to face spectator, with short brown curled hair and headband, mouth slightly open. Wearing a black shawl with grey lining over her shoulders, a cream dress with white sash and white lace around neck-line, adorned with jewelled pin. Here are floorplans for Lyme Manor, and two paintings of my kindred. Lyme inspired a fictional Christmas treatment that was published in 1952. You could say it is a blueprint for Downton Abbey. Lyme is a blueprint for several novels I have in mind. Time to get to them. Tis the spirit. I just found out Christopher Lee is kin to Ian Fleming, and thus myself via Elizabeth Rosemond Taylor, and Jane Lee. Not to mention the amazing Wilson family of Puritans. 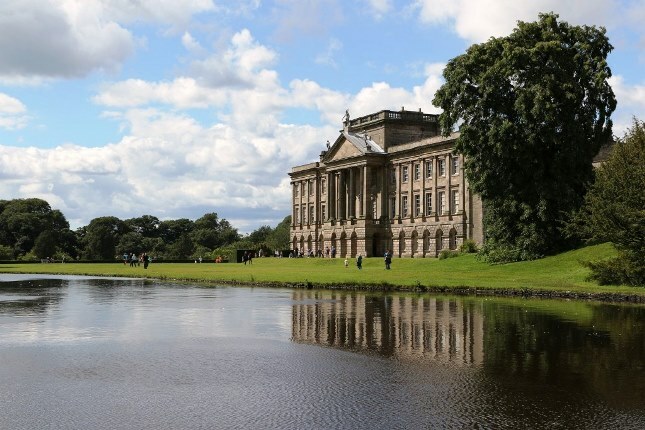 I was considering moving the digs of Victoria Bond to Lyme Park, along with another reluctant muse, Lara Roozemond. Capturing Beauty is one motive for establishing a National Trust. I have claimed my Bond book is writing itself. I pick up the bread crumbs in the Labyrinth, and, am titled Mad’. Time to stop casting my pearls before swine, and promote myself. Is it too late to become an actor? Is that my real calling? Some would say I would make a great Villain! I would love to play the Antichrist and showoff my real Biblical Knowledge. After all, he is a Christmas-like character who millions learn about in many Bible study groups located all over the world. And, who is this Magical Son of Man? SCENE: Franklin Graham is brought before me, in chains. Antichrist: Riddle me the mystery of the seven stars, and I will set you free! This is a role Christopher Lee was destined to play. Evangelicals will line up around the block carrying torches. Of course Donald Trump is going to make outrageous tweet- guesses in order to ruin the movie for everyone, which will lead to The War of Armageddon. 11) Lee was not only related to James Bond creator and author Ian Fleming — they were step-cousins — but Lee was actually one of Fleming’s first choices for the role of Bond, not least because of Lee’s World War II and SOC experiences. 5) During World War II, Lee joined the Royal Air Force but wasn’t allowed to fly because of a problem with his optic nerve. So he became an intelligence officer for the Long Range Desert Patrol, a forerunner of the SAS, Britain’s special forces. He fought the Nazis in North Africa, often having up to five missions a day. During this time he helped retake Sicily, prevented a mutiny among his troops, contracted malaria six times in a single year and climbed Mount Vesuvius three days before it erupted. 6) At some point during the war he moved from the LRDP to Winston Churchill’s even more elite Special Operations Executive, whose missions are literally still classified, but involved “conducting espionage, sabotage and reconnaissance in occupied Europe against the Axis powers.” The SOE was more informally called — and I can’t believe this somehow hasn’t been made into a movie yet — The Ministry of Ungentlemanly Warfare. We were promised that we would see the parts of Lyme that other tours didn’t reach, and so we did. But first we were given a brief history of the place. It started as a simple hunting lodge but the Elizabethans gave it a makeover and parts of the “L-shaped” building are still in evidence today. The big changes came in the early eighteenth century when an Italian architect was brought in. It was he who built the remaining two sides to make a hollow square, he who created the cloister effect in the courtyard and he who designed the classic Palladian South Front. The end result, however, was not an English country house but an Italian palazzo on the edge of the Peak District. A hundred years later an English architect, Lewis Wyatt, made extensive but subtle alterations, particularly to the service rooms and servant quarters, and this made the house much more practicable and convenient. 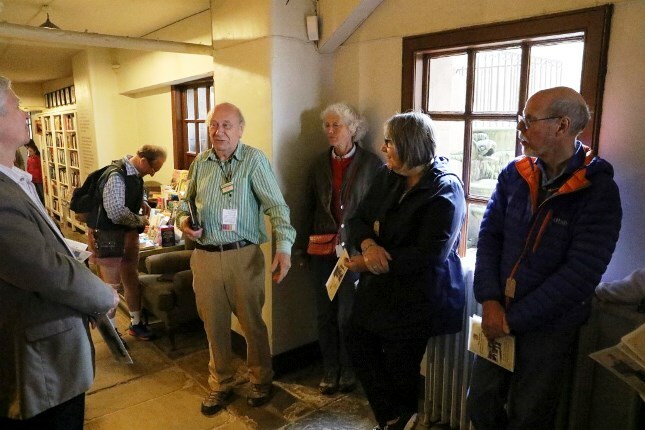 Our tour looked at how the house was organised and run in the “Golden Period” – that time before the First World War when this style of living was at its apogee. kep t a close watch on the baking that was being carried out. 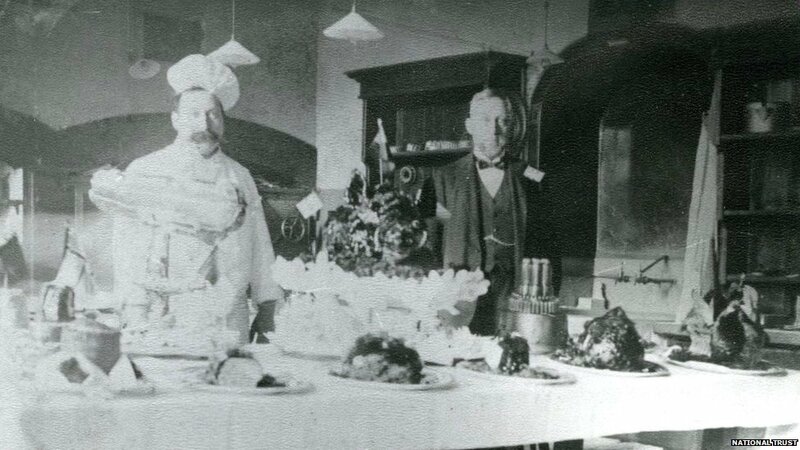 Lunch was the only formal meal of the day for the servants, preceded by a little procession of the upper servants around the courtyard to the servants hall. The same hall was used for Christmas parties for the estate children and the ceremony of Beef Distribution on Christmas Eve. Each followed a strict formula every year and rank played an important role in establishing a hierarchy. 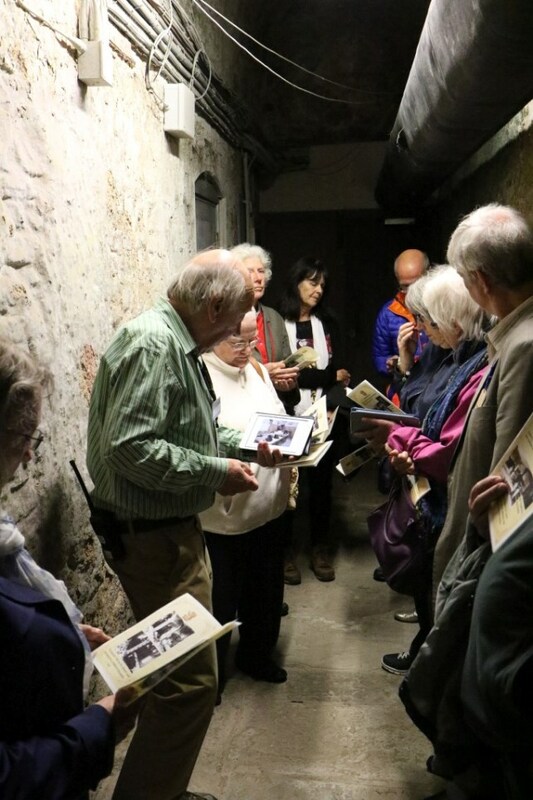 We then explored some of the more specialist activities – the salting room, the brush room and the lamp room. How do you keep meat with no refrigeration? Who cleans the expensive top hats? How many lamps do you need to illuminate a house with a hundred rooms? The pièce de résistance of the tour was the Dark Passage. (below) This was an underground tunnel built in the nineteenth century to give access to the kitchen (and to keep the hoi polloi) away from their betters. We all felt very much at home in these surroundings. It was spacious and roomy, not at all what we had been expecting. Off the passage were more specialist rooms including the most important of all, the brew house. At its height Lyme could produce 1100 gallons of beer at a time. Competition for Robinson’s! To be fair they supplied the whole estate. All employees, plus their families, as well as tradesmen and suppliers visiting the house. The brew house and the next door bakery produced plenty of heat but it was very cleverly dispelled by pumping it through into the adjacent Orangery. The fuel for all these processes was stored in a specially constructed yard adjacent to the brew house. The Legh family owned a large part of the South Lancashire coalfield so as well as giving them a substantial income (over £2 million at today’s value) it also meant that they had free coal. Just as well perhaps, considering that the house could use up to a ton and a half of coal each day. There was a clever design of chute allowing the coal to be tipped in from ground-level and adjacent to it was the same arrangement only larger, this time for logs. Finally we emerged from the tunnel to the end of our tour. But not quite the end. Neil gave us our bearings, pointing out the stables and the direction of the Cage as well as where to find the dog kennels. And for those who didn’t know, the funny wooden structure high on the garden wall, is a meat safe. After all, one has to hang one’s meat somewhere after a day’s hunting. Thank you Neil for a fascinating tour which more than lived up to its promises.